The Yes Big City is basically a slight change from the now discontinued YES The Optimistic that was very popular in 2011. The Big City is softer and comes in different sizes. We loved the YES Optimistic but the Big City is still one of our favorite boards when it comes to having a board that can ride the mountain very well and also give borderline excellent performance in powder. Rider Specs-James, Jimbo a few other riders that aren’t on the About Us page. 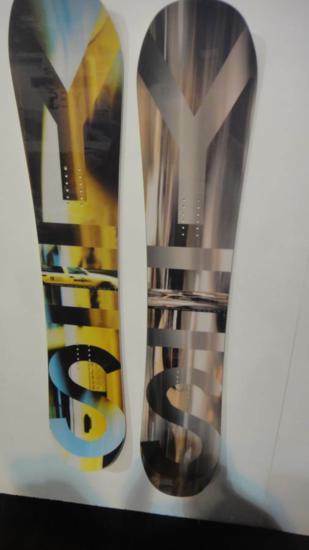 If you are looking for a good all mountian all conditions ride and can only buy one board the YES Big City is a great choice and it is very very similar to the YES Optimistic that we loved last year. Groomers– The YES Big City is very fun on groomers of almost any type or condition. This is about the same as the YES Optimistic. It’s fast base, hybrid camber and fun shape makes it a good ride carving regular or switch down any groomer. 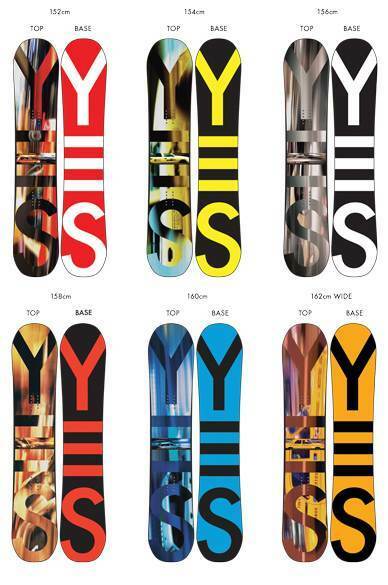 If you are all about groomers then this is a fast stable board board. Powder: The Big City has a 20mm set back and directional rocker which is pretty far for any board and expecially far back for a directional twin. The Optimistic had more like a 30mm set back or even more. If you like to take a freestyle approach to powder you can center the stance and ride switch very well. However where this board shines is when you set it back ride directional and take advantage of the extra rocker in the nose. 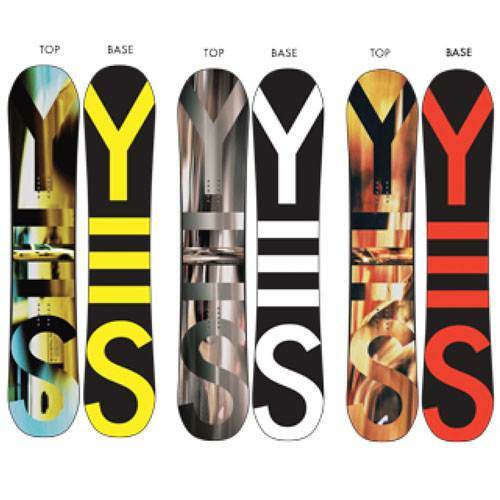 This year YES stepped it up and made an even more powder friendly board called the YES Pick Your Line which has the same set back, a bigger nose and a slightly tappered tail so if you are all about powder go for that. If you want one board for everything but live for powder than the YES Big City will be one of the better calls out there. Turn Initiation– The Big City is very easy to turn despite it’s med/stiff flex. If you haven’t ridden hybrid camber of this style it will take a few runs to get use to but once you do it will be very easy to initiate a short radius or long radius turn. Speed: This base is really fast. It keeps it’s momentum going even in the flats. When you combine that with the very damp core you have a very fast board that can handle just about any speed. It’s not going to keep up with a big racing board but it’s about as fast as you can get for an all mountain board. Weight– The YES Big City runs a bit on the heavy side of things but it weighs less than the YES Optimistic from last year. Edge Hold: The Big City holds an edge well in most conditions the sane person likes to ride in. In eally hard or icy conditions there are better boards out there. We’d like to se YES add ultimate traction which is a very mellow version of magnetraction. This would make the Big City have exceptional edge hold in just about any condition sane or insane people would ride in. Flex: Softer at the tip and tail and very stiff between the feet. Carving– For a mostly rocker hybrid camber board the Big City is really fun to carve. It’s not as much fun as the Rome Anthem or the Capita Black Snowboard of Death but it is still good for a belly scratching turn or two if the mood strikes you. We always try to carve out a good turn or two every run and this was really really fun once you get use to it. Switch: The Big City is a directional twin with a 2cm set back. If you have this board centered in stance it is very easy to ride switch. Actually we didn’t notice a difference switch or regular. Rails/Jibbing: The YES is almost borderline rough when it comes to rails and jibbing. If this is your thing then the YES Big City isn’t your board. It’s just too stiff and will bonk you on any technical rails or jibs. The 2011 Typo or 2012 Basic will be a better option for this task. Pipe: Just the opposite of Rails. This holds an edge well enough to carve up any pipe and we had a lot of fun with this board through the super and super duper pipe. Jumps: For some this board might be too stiff but for others this could be ideal. If you are into back country booters the Big City will be one of the best choices out there. The Big City has decent pop and can be pretty springy. We loved generating our own air on the mountain. All in all the YES Big City is one hell of a good aggressive all mountain board that will ride well in almost any condition. This and the Capita Black Snowboard of Death were two of our favorite aggressive all mountain snowboards to ride for 2012. Each have their own unique qualities. We would say that if you ride more powder then the Big City would be the call because it has some of the best powder performance out of any board in this category we have ridden. If you mainly ride harder conditions the Black Snowboard of Death will be the call due to it’s exceptional edge hold and fun carving ability. We try to get as many images of the YES Big City, but forgive us if they're not all there. Great for anywhere on the mountain. Right no about the charging hard and getting big air. Great in powder. Pretty stiff as far as jibbing, I'm probably gonna buy a better park board in the near future. Just a great all around board for all mountain riders who don't frequent the park.